KETCHUM, Idaho ” Firefighters had nearly half of the 69-square-mile Castle Rock fire contained Wednesday morning, but local law enforcement officials say they still don’t know when the residents of about 2,000 evacuated homes could return to the region. Fire managers said thunderstorms expected to hit the area later this week could increase fire activity, so fire crews were trying to build firelines around what is considered the top priority fire in the region. About 1,640 firefighters were battling the blaze, using 15 helicopters, 7 bulldozers and 102 engines. So far, no structures have been damaged by the fire. 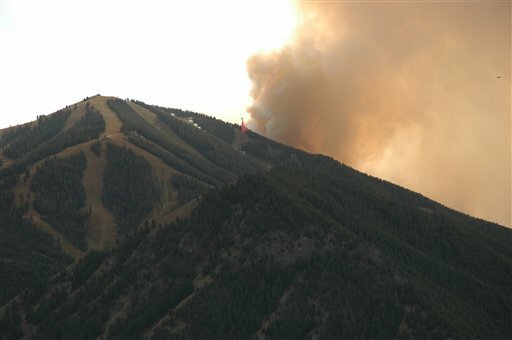 On Tuesday, gusty winds pushed flames near the borders of the Sun Valley Resort ski area even as air tankers and helicopters armed with red retardant made passes at five-minute intervals. The Castle Rock fire was “extremely active,” federal fire managers said. Amid the smoke, managers opted to leave ski lifts running ” not for people, but to keep errant flames from cooking cables that ferry more than 200,000 visitors up the slopes each winter. The fire started Aug. 17 with a lightning strike and so far three waves of evacuations have been ordered. Some of the 60 Idaho Army and Air National Guard soldiers who have been deployed to Ketchum were assisting residents, going door to door in the Warm Springs neighborhood with Blaine County sheriff’s officers. Some evacuees went to the Blaine County Community Campus, located in Hailey, 12 miles south of Ketchum. By early Tuesday evening, a handful of people had arrived, said Shawn Tolman, the Red Cross of Greater Idaho’s regional director for the eastern half of the state, though there were as many as 44 sleeping at the center on Sunday evening. Others opted to take shelter in local hotels or stay with friends or in empty condominiums owned by family. Bob and Julie Dunn were staying at her father’s condominium in a section of Ketchum that hadn’t been affected by the evacuation. Most people are taking the order seriously, Bob Dunn said. A wall of smoke greets visitors driving State Highway 75 into the Wood River Valley, where the ski area is located. Many of the nearby mountains are obscured. Jack Sibbach, a spokesman for the Sun Valley Co. that runs the 71-year-old, 510-room resort, said accommodations were roughly 90 percent full, though guests had begun some cancellations, including a 36-person group that opted to leave the valley. “We understand safety has to come first,” Sibbach said. He praised the more than 1,650 fire personnel from across the nation who are fighting what officials at the National Interagency Fire Center in Boise, Idaho, are calling the region’s top priority blaze. That’s in part because more than half of Blaine County’s $12 billion in net taxable value is in homes located in Sun Valley and Ketchum, both towns potentially in the fire’s path. With planes flying overhead, helicopters buzzing the ridgetop, smoke obscuring vision, and ashes floating down from the burning mountains, firefighters compared the area to a historic battle scene. “Makes you wonder what Pearl Harbor was like,” said group supervisor Brad Martin.